The Australian mining company Peninsula Energy, intent on mining the Karoo expanses for uranium, announced a third delay in its application for mining rights on 25 May 2017. One of the reasons is the discovery of a tiny species of plant, right where the bulldozers are waiting. Peninsula, with a local Black Economic Empowerment partner, plans to do open pit mining for uranium in the Kareepoort Block in the Eastern Cape (north west of Aberdeen), and Ryst Kuil and Quaggasfontein Blocks in the Western Cape (near Beaufort West). 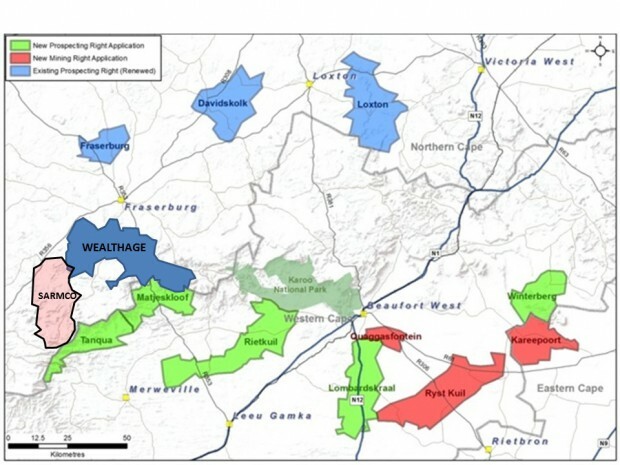 Peninsula’s concessions for exploration of Karoo uranium. The area, centred around Beaufort West, spans areas between Rietbron and Aberdeen in the east to Fraserburg and Merweville in the west. Two reasons for the delay were given to the Department of Mineral Resources. The first was that they had received close to 2000 objections and inputs from local residents, which overwhelmed their capacity. 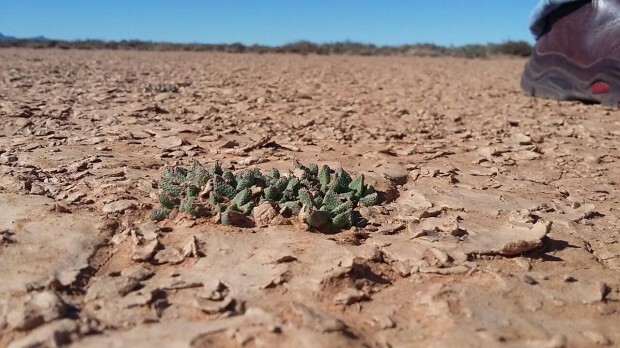 The second is the discovery of the tiny Nananthus succulent, which is no bigger than the headline on this page, by local farmers. The plant appears to be a brand-new Karoo species that will have to be studied in detail before its conservation status can be determined. The botanical survey commissioned by the mining house was of such inferior quality that it did not only overlook this plant, but more than a hundred other plant species as well. 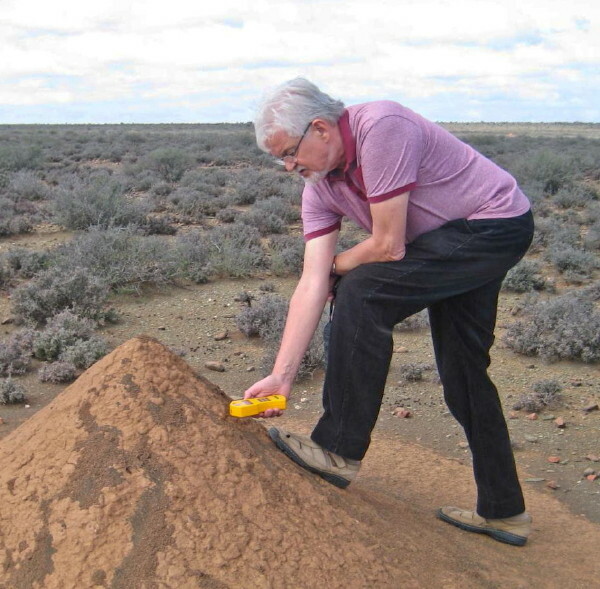 Dr Stefan Cramer measuring gamma radiation on an anthill over a uranium deposit. This is a small but significant victory for Karoo residents opposing uranium mining in their backyard. It is a harbinger for more obstacles to come, as there are many more and potentially more serious flaws in the application documents. By now, farmers are all alert and informed. Farming organisations are ready to act and have raised their voices forcefully. The pro-mining ANC lost again in recent crucial by-elections in Beaufort West. Wintry days indeed for miners interested in the Karoo uranium. 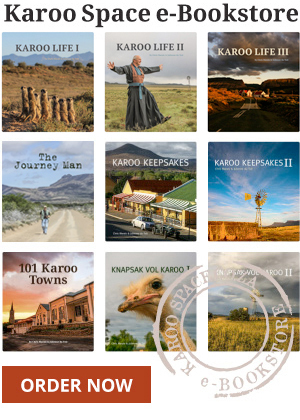 For background on the Karoo Uranium issue, click here to see this article, also written by Dr Stefan Cramer in January 2016. Geologist Dr Stefan Cramer is one of the science advisors to the Southern African Faith Communities’ Environmental Initiative (SAFCEI). This article has been edited with the addition of clearer, updated map, the latest number of objections and inputs, and the fact that local farmers discovered Nananthus. Watch M-Net’s investigative programme Carte Blanche on Sunday 25 June 2017 at 7pm for more on the Karoo uranium battle. Send them “packing for Perth” – permanently !! Fantastic, it is time that we all gather to protect our environment and leave it for future generations, to walk, camp and get close to nature with the cry of a jackal as you warm up around the crackling fire. Simply demonstrates that “big business” always tries to railroad the environment. This is exactly why the world is in such a mess – human greed for personal gain!